When I was gifted a good old-fashioned book voucher at Christmas (I say old-fashioned, it was in fact a credit card-style gift card) I decided to use it on a little NYRB Classics splurge. The few titles of theirs I had read previously had been quite simply brilliant and whilst I didn't expect it to be possible for all of them to be quite so impressive I had the same kind of confidence when browsing their catalogue as I have when looking at the backlist of Pushkin Press for example. I was prompted towards this book after Trevor of The Mookse And The Gripes selected it as one of his books of last year and it certainly didn't disappoint. It is easily one of the most original books I have ever read, one that defies easy categorisation making it exactly the kind of book that will appeal to the lover of fiction with wide tastes in search of something a bit different. What do you by the book lover who has everything? Well, something like this would be a real treat (unless they already have this too). So having said that it is a book that defies categorisation, how do I go about describing it? Is it science fiction, magical realism, metaphysical examination, adventure story? 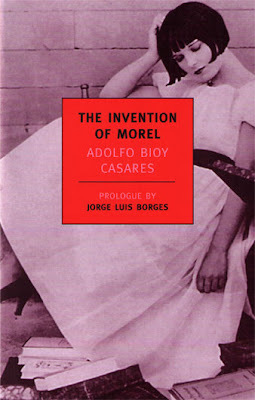 Knowing that the Argentine Casares counted Borges as a mentor, friend and collaborator might help to put his work into some context (In his short prologue Borges says of the book that 'To classify it as perfect is neither an imprecision nor a hyperbole'). Writing anything about it is a challenge as one doesn't want to reveal too much of its plot for fear of spoiling the genuine pleasure of coming to it unknowing and attempting to solve the riddle oneself. Here is the opening paragraph. Today, on this island, a miracle happened: summer came ahead of time. I moved my bed out by the swimming pool, but then, because it was impossible to sleep, I stayed in the water for a long time. The heat was so intense that after I had been out of the pool for only two or three minutes I was already bathed in perspiration again. As day was breaking, I awoke to the sound of a phonograph record. Afraid to go back to the museum to get my things, I ran away down through the ravine. Now I am in the lowlands at the southern part of the island, where the aquatic plants grow, where mosquitoes torment me, where I find myself waist-deep in dirty streams of sea water. And, what is worse, I realize that there was no need to run away at all. Those people did not come here on my account; I believe they did not even see me. Our narrator is an escaped convict hiding out on an island where he has remained undisturbed for a while, the island being host allegedly to a deadly disease that keeps both pirates and holidaymakers away. So who are these newcomers to the island, and why is it that they seem to be unaware of his presence? The museum from which he has been driven by their arrival is another of the island's mysteries. One of three buildings completed in 1924 the question remains: who built them, to what purpose and why were they abandoned? But that's enough questions for now. Another driving force through the novel is hinted at by the book's cover. Apparently inspired by Casares' fascination with movie star Louise Brooks, our narrator becomes fascinated by one of the island's new arrivals, a woman whose name he later discovers is Faustine. I had nothing to hope for. That was not so horrible - and the acceptance of that fact brought me peace of mind. But now the woman has changed all that. And hope is the one thing I must fear. She watches the sunset every afternoon; from my hiding place I watch her. Yesterday, and again today, I discovered that my nights and days wait for this hour. The woman with a gypsy's sensuality and a large, bright coloured scarf on her head, is a ridiculous figure. But I still feel (perhaps I only half believe this) that if she looked at me for a moment, spoke to me only once, I would derive from those simple acts the sort of stimulus a man obtains from friends, from relatives, and, most of all, from the woman he loves. 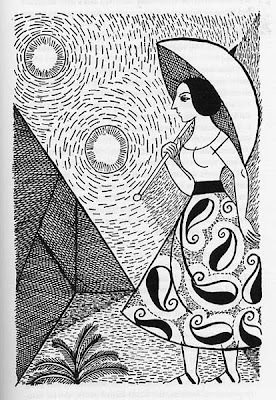 It becomes a daily rite, his watching of her watching the sunset, brought to life by one of the illustrations by Borges' sister, Norah Borges De Torre, stark black and white images that communicate something of the unbearable heat of the island. His loneliness now has a possible cure but no matter how hard he tries he doesn't seem to be able to make that connection with her that he so longs for. So the book is in part a meditation on love, loneliness and desire, but near its end, when the reader is more aware of what exactly is going on, Casares takes his themes even further returning to something our convict had been theorising about as he sat in the dock during his trial. I believe we lose immortality because we have not conquered our opposition to death; we keep insisting on the primary rudimentary idea: that the whole body should be kept alive. We should seek to preserve only the part that has to do with consciousness. I'll say no more and urge you to read the book. Don't wait for a voucher, make a gift of it to yourself. So glad you found and enjoyed this one, William! I've recommended it to pretty much everyone I run into and everyone who has eventually read it enjoyed it completely. It is a true treasure. Can't wait to see what other NYRB Classics you got. They certainly have my confidence -- and tomorrow's review space! I really loved this book Trevor and find myself amused by the combination of being incapable of describing what it's like to people whilst wanting to say enough to make them want to read it - immediately. Other NYRB reviews will be forthcoming. I'm impressed by the width of their list as well as the quality and there's so much to be said for the confidence one feels when selecting one of their books, even at random.